Students use their observation skills to identify four sets of variables of soil: 1) hard/soft, 2) intact/loose, 3) high/low, and 4) steep/shallow. They also interact with peers to come to consensus about the characteristics that influence erosion, transportation and deposition. Metacognitive components of the activityStudents view pictures and must choose the high/low, steep/shallow, loose/intact, and soft/hard portions of the soil. When they stamp that portion, they must consider prior experiences and observations that made them think about their choice. 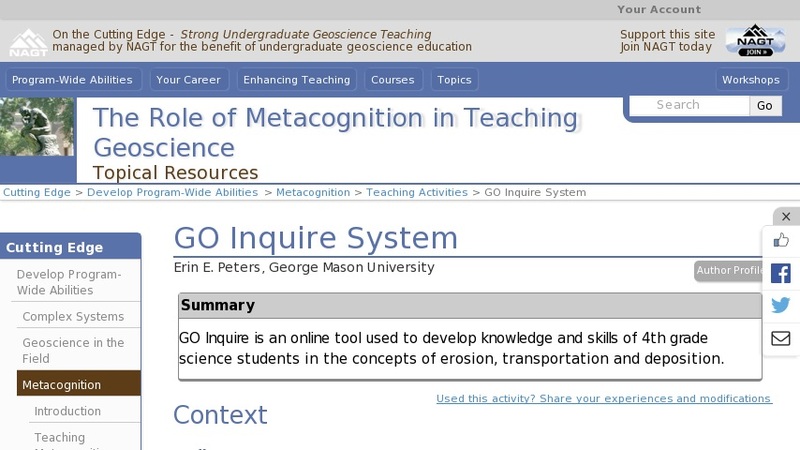 Metacognitive goals for this activity:Students are expected to connect their decisions with the prior knowledge activated and sythesized to logically choose the position. Assessing students' metacognitionDissertation work by Dr. John Baek has shown that students who can explicate their reasons for location choice in observations have more detailed and accurate explanations (conclusions).